If anywhere wants to claim to be one of the most beautiful Great British Drives it will have to do battle with the Cotswolds. This route takes in some of the most picturesque towns and countryside in the British Isles with a combination of quiet and secluded valleys, streams of crystal water and high streets that will make visitors feel they’re on the set of a period drama. 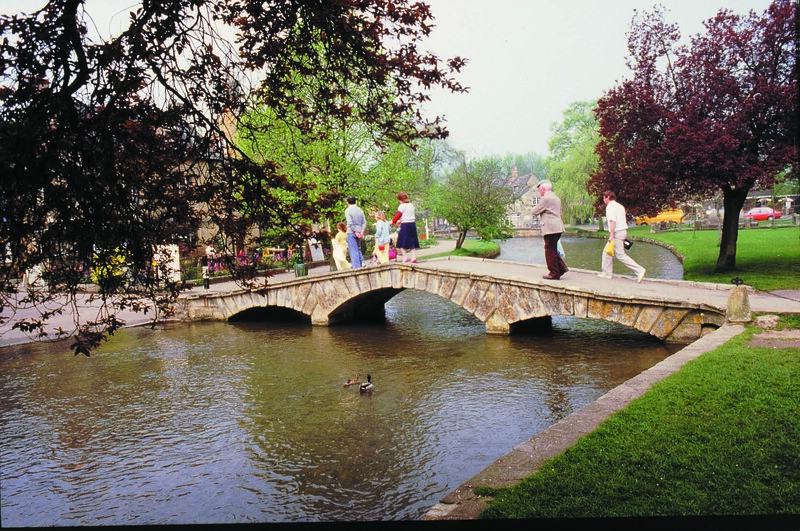 This edition of Green Flag’s Great British Drives begins in a village that has all the above attributes and more: Bourton-on-the-Water. Turn off the A40 onto the A429 and within a couple of miles you’ll be in the village that describes itself as the Venice of the Cotswolds. A must-visit for car fans is the Cotswold Motoring Museum and Toy Collection. Housed in a quaint looking building that’s typical of the area, the museum contains a varied selection of cars and caravans but also a huge number of toys and advertising signs that help bring bygone eras to life for all age groups. Once you’ve torn yourself away from the museum, head for the Slaughters. You’ll get to Lower Slaughter first where, if you’ve got time, you can pause for a paddle in the clear waters of the stream. Then it’s on to the equally picturesque Upper Slaughter before turning right onto the B4068 heading for Stow-on-the-Wold. This lovely market town is the highest and arguably the best known of all the towns in the Cotswolds. Park near to the tourist information centre then make a beeline for the quirks of the Cotswold Cricket Museum, where sports fans and traditionalists alike can study caps, bats, balls and other memorabilia. If you’re there in either May or October, you may want to visit the Gypsy Horse Fair which is on for just one day and sees hundreds of horses being paraded and sold – gypsy style. Moving on and at the fork in the road, continue along the A429 towards Moreton-in-Marsh. Another bustling market town, many of the buildings on the high street date from the 17th and 18th Century, giving Moreton-in-Marsh that classic Cotswold character. The town was first given its market charter in the 13th Century and still holds a vibrant market every Tuesday. Then should you get peckish, there are various pubs, inns and restaurants to satisfy a selection of palates. Heading out of town along the A44 towards our next stop, Broadway, it’s well worth pausing at the Wellington Aviation Museum. This tribute to the World War Two activities of the nearby air base might not have any full-size aircraft but it’s full of fascinating artefacts to keep history buffs occupied for hours. Continuing along the A44 and a stop at Broadway Tower is an absolute must. This was the brainchild of 18th Century gardening legend Capability Brown. Completed in 1798 it offers a dramatic view over 16 counties and on a clear day you can see the Black Mountains and Birmingham. Instead of heading into Broadway itself, to finish off, retrace your steps and take the B4081 to Chipping Campden. This has been described as the ‘most perfect high street in England’. With its chocolate box terraces of limestone shops it easily lives up to the billing. It is also the perfect place to bring this edition of Great British Drives to a close and enjoy some down time in one of Chipping Campden’s plentiful inns. And now you have posted this area on here, the area will be ruined by the extra cars trying to get there.